It’s time to draw anime characters, right? Yeah, we have been waiting for this too. 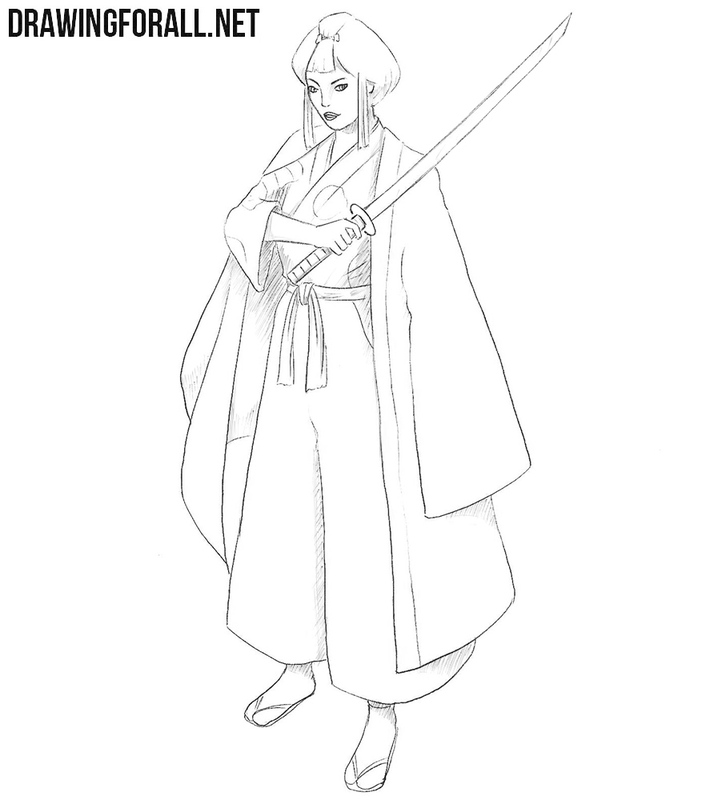 So today we will tell you how to draw Lady Eboshi from Princess Mononoke. You probably know that this anime cartoon is one of the great masterpieces created by Hayao Miyazaki. First we draw the stickman (in this case it is stickwoman). 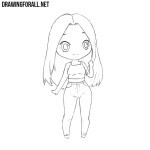 We draw an ordinary female figure like in the first step of this drawing tutorial. 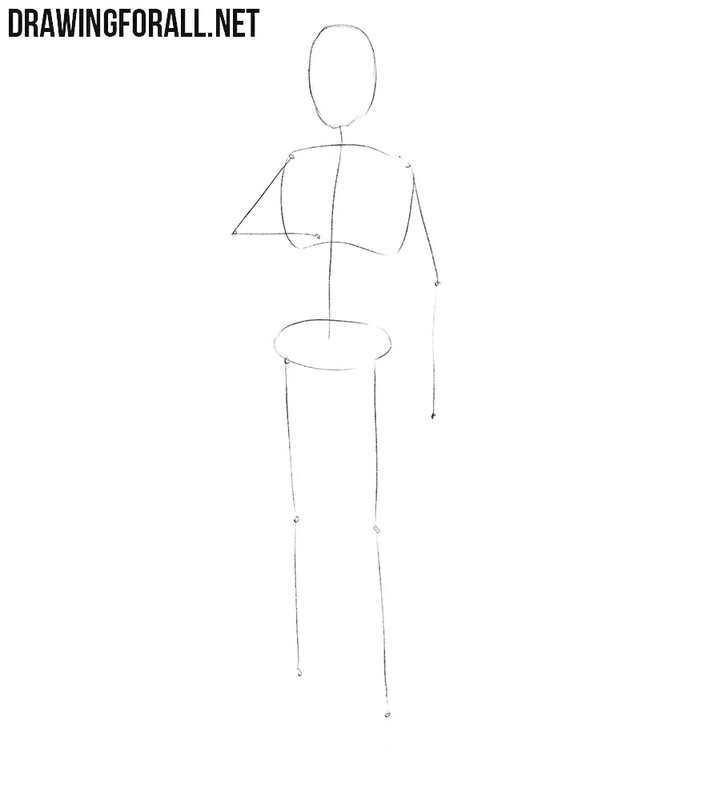 The main thing when drawing a female figure is the right balance between shoulders and pelvis. Shoulders should not be wider than the pelvis. In this step we continue to work with Lady Eboshi’s figure. 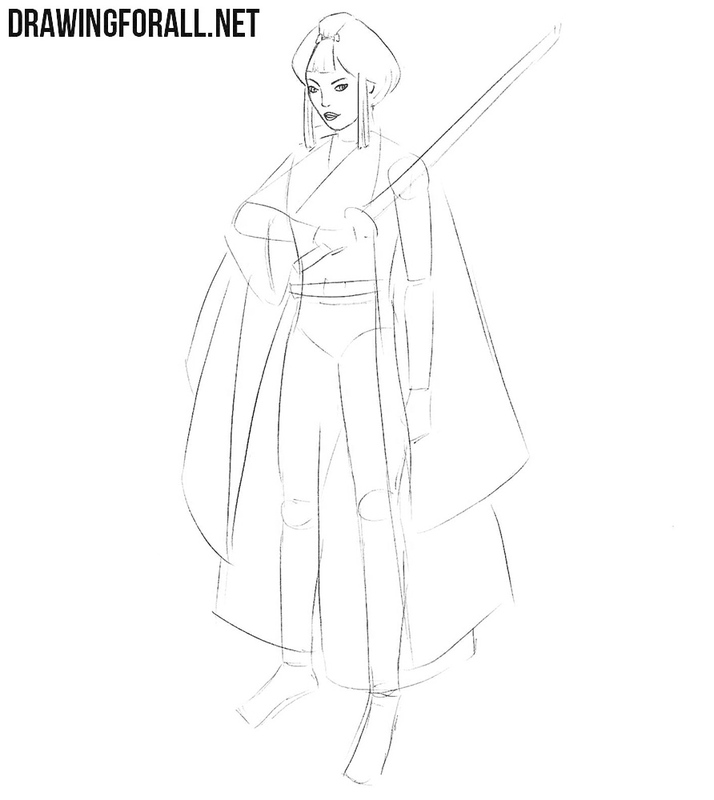 Now it’s time to make a silhouette based on the lines from the previous step. 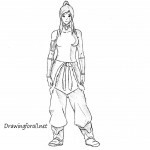 All the actions that we need to do are similar to the actions from the second step of the lesson about how to draw Avatar Korra. 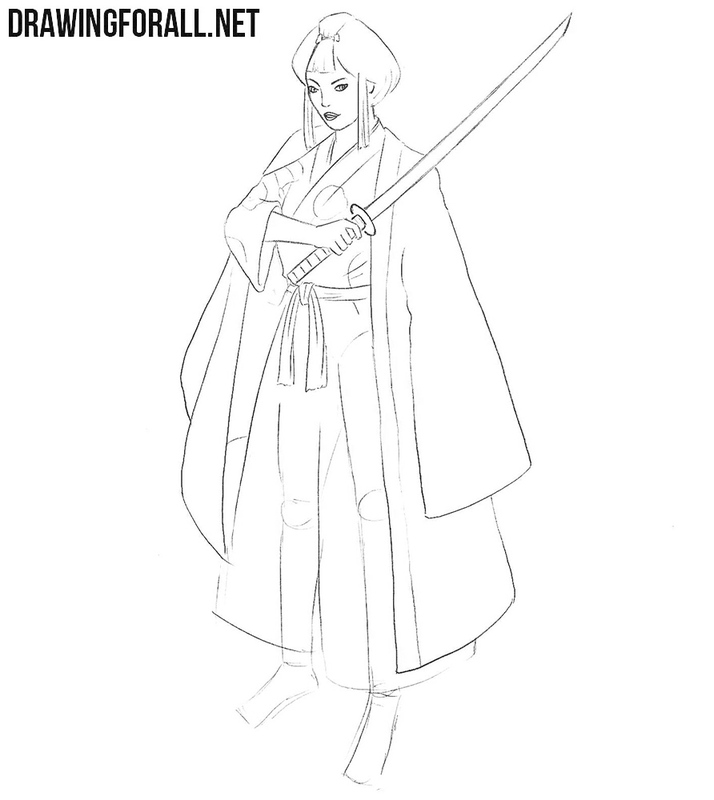 Now let’s add the main details to the Lady Eboshi drawing. First of all sketch out features of the face using simple lines. Next, draw a bob hairstyle.This is of course not a real bob haircut, but at this step the contours are similar to this. After that you can sketch out wide loose suit. You see a lot of lines in this step and you might think that it is very difficult. 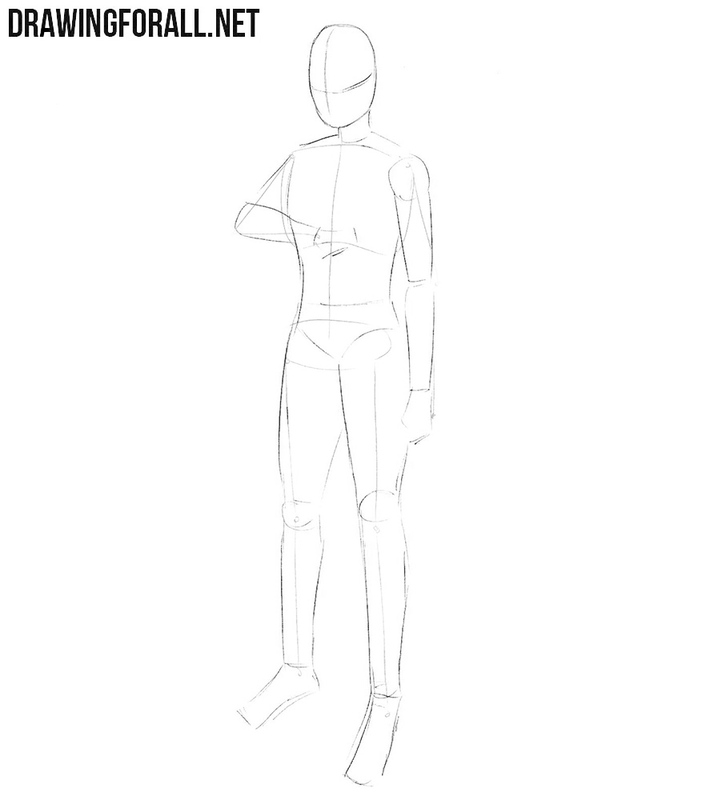 It will not be such a difficult task if you draw in stages, starting from the shoulders and then moving to the legs. Let’s start working with the final details. Carefully draw the hairstyle of our Lady Eboshi. Using smooth careful lines draw the eyes, nose and lips. Outline the contour of the face with a narrowing chin. We can not see the left hand of our heroine. So in this step we will draw only the right hand. We draw a wide loose sleeve that hangs from the forearm. Do not forget to mark the collar and the pattern on the fabric of the sleeve. The hardest part of this step is drawing a fist. You can read this article on how to draw palms and fists to make it easier for you. Using straight lines draw the wear that look like kataginu. 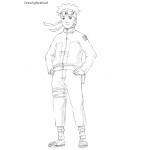 Kataginu is a special samurai clothing – you can see kataginu in this drawing tutorial. Draw a belt that is located on the waist of our heroine. At the end of the lesson, draw a few folds on the fabric and erase all the extra guide lines. In the previous steps we drew the upper part of Lady Eboshi, and in this step we will draw the lower part of the body. Here we will need to draw out the contours of wide loose pants with the help of smooth lines. Also we draw the legs in traditional shoes and remove all unnecessary guidelines from this picture. Lady Eboshi is almost drawn. So we just have to make our picture more voluminous and realistic. 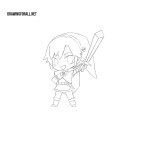 To do this, we will draw the shadows using the classic hatching method. As you can see, the hatching here located in the least illuminated areas of the character’s body, that is, where light does not fall. It was the drawing tutorial in which we showed how to draw famous anime character – Lady Eboshi from the anime cartoon Princess Mononoke. 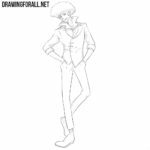 We will create more anime drawing tutorial in the coming days. If you are anime fan don’t forget to write about it comments. Goodbye!